These are always the hardest things to write – tributes to great people who are taken way too soon. Unfortunately it seems as if things like this happen way too often, but maybe it’s magnified because Covington is such a small town where everyone knows each other. Kevin Finfrock —- the son of George and Terry Finfrock and a member of the Covington Athletic Hall of Fame and Defiance College Athletic Hall of Fame — passed away unexpectedly on Sunday, January 27, 2019 at his home in West Milton. Kevin was a 1981 graduate of Covington High School and a standout athlete in football, basketball and track. He was a member of the 1979 state runner-up football team, the 1980 state semi-finalist football team, the 1981 basketball team that finished 24-1 and reached the regional final, and was a member of the 1981 state runner-up 4×100 relay team who still holds the school record in a time of 43.88. In 1980 Finfrock rushed for 1,298 yards, which at the time was the second highest single season rushing total in school history behind Denny Cain’s 1,354 yards in 1971. Finfrock went on to play collegiate football at Defiance, where he was NAIA All-American as a sophomore, junior and senior. He was also named Male Athlete of the Year in 1984 and 1985. After college Finfrock had several tryouts with NFL teams for before hanging up his cleats for good. After his playing days were over, Finfrock got into teaching and coaching in order to pass on his passion for the game of football to others. And after a stint at Piqua High School as an assistant coach under legendary coach Bill Nees, Finfrock joined Ted Peacock’s coaching staff as the offensive coordinator at Covington in 1999. 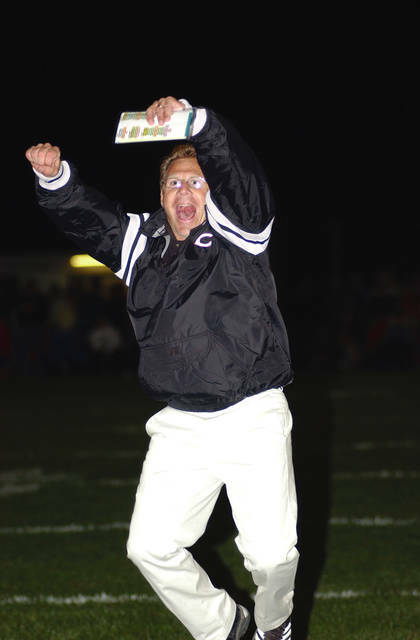 During Peacock’s tenure with Finfrock as the offensive coordinator, Covington compiled an amazing 42-5 record and qualified for the state playoffs in 1999, 2000, 2001 and 2002. Coach Peacock stepped down after the 2002 season and Finfrock took over the helm after many players, coaches and supporters went to a school board meeting on April 30, 2003 to express their desire to have Kevin become the new head football coach. And after a 5-0 vote from the school board, Kevin Finfrock realized a dream of becoming the 14th head coach at the school where he himself was once a standout player. Finfrock coached the Buccaneers for four seasons, accumulating a 34-9 record and leading his teams to the state playoffs in 2003, 2005 and 2006. During his tenure Kevin founded the annual “Kids Camp”, the annual “Lift-A-Thon” and was instrumental in the construction of the weight room in 2005. For Finfrock, it was the impact he had on kids that meant the most to him. After his coaching tenure at Covington was over in 2006, Kevin focused on the most important thing in his life – his family. He and his wide Diana became spectators at sporting events of their three children Kaci, Jake and Jessi – all standouts at Milton Union High School.